The Southern Cross, more properly known as Crux Australis or the official name Crux, is one of the brightest and romantic constellations of the entire sky. Crux, from the Latin term for ‘Cross’, is symbolised on some of the southern countries own national flags, and this is especially true for all Australians and New Zealanders who at least know of its existence. It once symbolised defiantly on the Victoria Eureka Flag in 1854, and made the official ‘Made in Australia’ labels through 1947 to 1974 for most goods manufactured in this country. The Australian Cricket team sing proudly in their irreverent version of “Under the Southern Cross I stand…”, which still evokes pride and nationalism among sport-loving Australians. In the sky the constellation of Crux does not really look like a cross but perhaps more resembles a flying kite. The faintest of the five stars of this brilliant stellar asterism makes a decided dent against its symmetry. To the east are the Southern Pointers, often just named The Pointers of the two stars Alpha and Beta Centauri that aim slightly north of Crux’s true centre, following the Cross in the eternal circle of the celestial sphere. We are drawn to this area because of the concentration of bright stars, mixed with the diverse range of bright and interesting celestial objects. This area is an ideal place for the beginner who has obtained an optical telescope, and start his astronomical searching through the skies. This section gives a history of the region, a suitable map, and general descriptions of objects the observer may wish to gain some experience. Crux was likely named by either the sailor A. Royer in 1679, or by the French explorer Abbé de La Caille in 1670. In ancient times it was included with the constellation of Centaurus. As time passed-by some of the western world migrated south, first to the southern Africa, South America. Soon the constellation was give an individual identity. In the 1930s the International Astronomical Union (IAU), ratified Crux as a unique constellation instead of being the subsidiary of the surrounding Centaurus. Crux has the smallest area of the eight-eight constellations, being a mere 68.477 square degrees, some 0.16% of the entire sky, and rates closely behind the other two northern minnows of Sagitta and Vulpecula. Due to its position it culminates on March 30th at midnight, or May 14th at 9 pm. From 33 degrees South latitude to the South Pole, Crux is circumpolar, so its outline never sets. In Sydney, it just scrapes the southern horizon generally around 9 p.m. during the beginning of Spring. In the city sky-glow it always can just be seen, even when upside-down and near the horizon, where atmospheric refraction distorts the familiar shape to appear much larger in size than normal. In the northern hemisphere, the Cross can be seen scrapping just above the southern horizon during spring from the southern United States, North Africa and Southern Asia. Its circumpolar motion also means Crux can be used as a direction finder for true south, as long as you are south of the equator by five degrees or so. Just proportion four-and-a-half times the longest length, between Gamma and Alpha Crucis, to the point where the South Celestial Pole (SCP) lies. Dropping down from the SCP to the horizon indicates the potion of true South. Boy Scouts and farmers in their agricultural fields use this method to find their way home on dark clear nights. C R U X is wholly embedded within a very bright portion of the southern Milky Way and whose size has the smallest area of any of the established eighty-eight constellations. Conversely, it also contains three of the most prominent night-time first magnitude stars that are all placed within the Top 25 of stars. These luminaries are Acrux, Mimosa and Gacrux; being respectively ranked as the 15th, 21st and 25th in apparent brightness - more properly in termed the apparent visual magnitude. Crux until the last few centuries has not always been recognised as a constellation in its own right. It was once placed as a small minor subsidiary of the surrounding constellation of Centaurus that now appears around three sides of the Cross to the east, west and north. Crux didn’t really become its own unique constellation until it was finally agreed and ratified in the 1930’s by the now world-wide and officially recognised International Astronomical Union (IAU) controlling all the naming, discovery and terminology of astronomical bodies. In total area Crux covers merely 68.477 square degrees of the sky. This small area is only about 0.16% of the entire sky, rating very closely behind the other two minnow constellations of Sagitta and Vulpecula in the northern Milky Way. Only five (5) main stars make out the outline of the Cross, and like most of the other eighty-seven constellations, have given names based on a combination of the Greek alphabet — whose order in nearly all cases signifies decreasing brightness, followed by the constellation’s name. For Crux, each of the brighter five stars just happens to descend in brightness in a clockwise manner, hence the five brightest stars in the outline are named Alpha, Beta, Gamma, Delta and Epsilon. Next is added the constellation name, and this is written in its genitive form of possession, following its Latin-like syntax. So instead of calling the star ‘Alpha of Crux’ it becomes to be called instead Alpha Crucis. Astronomers have further summarise this by sometimes using a later agreed three-letter abbreviation - so Alpha Crucis can be written just as Alpha Cru or even only as α Cru. Once a four-letter sequence was suggested also in the 1930’s, but this was mercifully rejected aftera while as being unnecessarily too complicated. Given or proper names for stars are usually only reserved for only the brightest of stars, but our Crux’s case, onlyAlpha, Beta and Gamma Crucis have them. They may have had names in the past but none has remained in popular usage today. Interestingly, the Greek nomenclature of these stars around the beginning of the 15th Century were introduced quite differently. One of the first formulations of these was created by the German Protestant lawyer, Johann Bayer (or Philolaus) (1572-1625) who labelled the four brightest stars as the Centaurus stars ε [epsilon], ζ [zeta], υ [upsilon] and ξ [xi]. I.e. Where α=ζ, β=ξ, γ=ε and δ=υ; as also given in Bayer’s attached catalogue. Here Crux, as he describes, is named the moderis crux. Usually called Acrux —, whose origin is a clever combination of its Greek letter and constellation name. Modern usage of the name was likely first coined by the American astronomical popularist Eliijah H. Burritt somewhere between 1833 and 1856, where the name appears next to this star in his own star atlas that sold over 250,000 copies. Acrux to the eye has a distinct cold steel blue tint but is paler than Virgo’s 1st magnitude star Spica — some 53° further north of its position. As mentioned before, Alpha Crucis was part of Centaurus which marked the place of the right rear hoof of legs of the Centaur. Prior to cartographer Bayer, the star assigned the Greek letter ζ. Oddly, ζ Centauri is now recognised as the shoulder of the Centaur! This star is been properly called Mimosa though many sources, mainly expressed by northern hemisphere observers, continue to improperly claim the name Becrux. This modern name never been recognised as such and has been contrived without much thought or humble reverence. Similar in colour to Acrux the star exhibits the same cold-bluish white tint. Its brightness is also about half a stellar magnitude fainter than Acrux. Mimosa is the most western of the stars in the main asterism being close to the famous open star cluster called the Jewel Box. Indeed the name is quite appropriate as its flower does look like some dazzling bright star in the sunlight,agreeing well with this Southern Star of the Cross. Named Gacrux was added in the early 20th Century, and also mimics Burritt’s formulation of the name for the brighter star Acrux. According to Richard Allen’s “Star Names: There Lore and Meaning”. Lying at the top or more northerly part of the Cross, Gacrux is visually different in colour to the the other principal blue stars, being a vivid orangery-red or reddish-orange tint. To my eyes this colour is much paler than Antares / α Scorpii red colour but is certainly richer than the northern 1st magnitude orange star Arcturus. Gamma Crucis is roughly about 0.5 magnitudes fainter than Mimosa and almost a whole magnitude fainter than Acrux. Both Gacrux and Acrux point in the direction of the South Celestial Pole and are presently separated (2005) by some 6.0°. As yet this star has not been yet blessed with a decent proper name. At 2.7v magnitude, almost exactly two magnitudes fainter than Acrux. It lies on the eastern side of the Cross. Like Acrux and Mimosa the star appears as a gorgeous pale blue which is perhaps just a little paler than both of them. This is the faintest of the five prominent stars, but has no given name. Its main contradiction of our brilliant stellar asterism is that it makes a decided dent against the constellation’s overall symmetry. Epsilon Crucis in fact was just simply ignored by the early stellar cartographers, and this can be clearly seen within Bayer’s 1603 Map of this region of sky. The star is much fainter than the other four principle stars, being just over 3 magnitudes fainter than Acrux — being listed as 3.8v magnitude. Often Epsilon Crucis faintness confuses many novices in finding the Cross. It is also different in colour, appearing to my eyes as a washed-out almost ‘dirty’ orange star. To the east by some degrees are the two Southern Pointers, often called simply The Pointers as they point towards the Cross. These brilliant southern 1st magnitude stars are commonly known just as Alpha Centauri and Beta Centauri but do not lie within the boundaries Crux. Both stars are presently separated in distance of some 4.4° degrees, which is similar in distance to the northern zodiacal constellation of Gemini whose 1st magnitude stars, Castor and Pollux are separated by 4.5°. These ‘Northern Pointers’ however are more fainter than the southern ones. α and β Centauri are within the large constellation of Centaurus the Centaur being the mythical creature of the Ancient world that combined both the intelligence of Man and with the speed and grace of the horse. Visually this bright stellar duo are conveniently are aligned to point directly to the southern cross, even though their true aim is actually just slightly north of Crux’s true centre — roughly 50′north of γ Crucis. The Pointers always chase the Cross in its eternal circle around the celestial sphere, but never catches them. Alpha Centauri is position in the sky lies some 15.6° east of Acrux. The star is unmistakable because of its sheer brightness — the third brightest in the night-time sky — and gorgeous rich golden-yellow colour that contrasts will with the cold steel-blue colour of its neighbour, Beta Centauri, and many of the other blue stars of the Cross. It is perhaps the most famous star of all being our closest stellar neighbour. Its distance is about 1.3 parsecs or 4.3 light-years, simply meaning that the light we see from the star has taken 4.3 years to reach us. It is also the 3rd brightest star in the sky, placed only behind the Sirius in Canis Major and southern Canopus in Carina. Although classically deemed as 1st magnitude stars, all three have modernly determined visual brightness that are negative values. Sirius is presently given as -1.46 magnitude followed by -0.72 for Canopus. α Cen is -0.06. Through my eyes I think Arcturus certainly looks fainter the α Cen merely by the fact that Arcturus is more orangery-red in colour compared to α Cen’s intense rich yellow. This is probably due to the human eye being less sensitive to redder objects, thus making such reddened stars appear fainter. α Cen proper name is Rigel Kentaurus or sometimes abbreviated as Rigel Kent. This is a relatively new name was coined by the early aviators during the early 20th Century who used the star for navigation purposes. During the 1st Millennium A.D, its Arabic name was Wazn, but this usage has not continued or passed on into modern times even though β Centauri has! Beta Centauri happens to be about magnitude fainter than Alpha Centauri and lies between it and the Cross — some 4.4° from α Cen and9.4° West of β Crucis. At the present time, β Centauri lies some 28′ further north than α Centauri. Although the star is just slightly fainter than α Centauri the true distance is some 525 light-years — being 122 times further away. This clearly suggest that β Centauri is far more luminous than the Sun, and is more akin with the other blue luminous stars of the Cross. β Centauri is named either Hadar or Agena. Hadar is an Arabian name certainly the older name that dates back to 1st Millennium A.D.
C R U X in history was not recognised as the same famed constellation that we commonly acknowledge today. We do know that in ancient times Crux was only included among the stars of the constellation of Centaurus. In Roman times the Cross were given only as status as a small sub-group of stars or asterism of Centaurus that was known as Thronis Caesaris in veneration of their emperor and god, Augustus Caesar. This is surprising considering the brightness of the stars, which has been tentatively an not very convincingly due to the star’s proximity to the southern horizon. One of the first instances of the Southern Cross in the historical literature was by Dante’s (1265-1321) in the famous trilogy “Paradisio”, “Inferno” and “Purgatoio”. Here in the last book, Purgatio, he describes only the four principle southern stars of the Cross — naming them after the admirable virtues of Justice, Prudence, Temperance and Fortitude. Dante seems once to have seen the Cross low on the southern horizon and likely missed faint Epsilon Crucis in haze or poor seeing. Yet of all of these claims it remains quite uncertain if these individuals had any influence with its popularist name of today. In my own opinion the true derivation of Crux’s name will likely to remain forever unknown to us. As Western World and its civilisation expanded, European populations began to migrate ever southward. It was at this time that the bright stars of Crux gained new respect and individual identity. This can be seen from the writings of these first arrivals either as new explorers and travellers to the then unknown new lands of the South, which began in earnest somewhere between the 13th to the early 15th Century. Each person was venturing forward in the hope or promise of finding new opportunities in the ‘New World’ and perhaps to fulfil their own dreams or to make their fortunes. Most first journeyed either Southern Africa or South America where this wonderfully bright and conspicuous constellation could be seen. In time this was to be expanded across the world to the lands of the East Indies, the islands of the Pacific, the North and South islands of New Zealand, and ‘Terra Australis’ or ‘New Holland’ — the now known Australia of today. During these early days of southern hemisphere exploration most of the European voyagers and settlers made the Cross their familiar and nightly friend — being the companion of sorts thwarting the real hazards when making crossings of an often unpredictable ocean over long distances. This romance continues today. Over the years I have seen many amateur astronomers, sitting and talking around a night-time campfire on bitterly cold winter nights. By warming themselves during these short break from the cold air and their long observation sessions, they soon forget all about the many deep-sky wonders they see through their telescopes, and just as in the days of old, simply look and ponder at the southern night sky. Sometimes there falls an almost awed silence, as even their own hearts have become warm and comfortable by these familiar stars like the Cross. One was seeing the Southern Cross in the wee morning hours from Banka Island, which is an island off western Sumatra 100 kilometres due south of Singapore, and a little south of the equator but a few hundred kilometres. My view occurred on 18th March 1988 at about 4 a.m. while sitting as a passenger in the back of a four-wheel drive while travelling to a the site to see a dawn total solar eclipse. A group of us had stayed in a Tin mine which was in the centre of the island but too far north from placed where we wished to be. Banka island is split into two geographical area divided by a several short but deep bogs covering several kilometres. Here all vehicles have to traverse. It wasn’t much fun in the daylight but night was a heart-pumping challenge in the dark. I saw the Cross peaking in and out of the trees as the vehicle moved along the dirt road. It was sadly inclined 40° to the horizon and placed slightly west of south. It struck me how beautiful these stars were and how much larger it seemed from the refraction through the tropical atmosphere. Among the Australian Aborigines. Maori and the Pacific Islanders there are many legends associated with this region of the sky. Most are either depicted on cave or bark paintings or having been passed down through the generations by simple word-of-mouth. For example, one Aboriginal tribe explained that the fish Alakilijia once originated from the depths of the Coal Sack, which was imagined as a deep hole in the river of the Milky Way. Two brothers Wanamountya (α and β Crucis) were in the river hunting for food when they came across a fish. Naturally they seize their big opportunity and quickly speared the fish and took it ashore to eat it. Both set up a campfire (δ and γ Crucis), which are both red in colour) and shared their catch. Their two friends are on the other side of the river (α and β Centauri) and between themare their boomerangs, from which all time is marked, made by the rhythm of the tools hitting the ground. 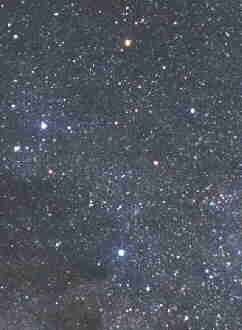 Another legend was that the stars of the Southern Cross represents the man Mululu and his four daughters. One day, when he had grown very old, he called his daughters together to discuss their future. Having no sons, Mululu expressed his grave concern that after he was gone there would be no one to look after and protect them. To avoid this, he came up with the innovative suggestion to solve this problem by asking his daughters to join him in the sky. Mululu explained that a clever medicine man named Conduk had once explained how this could be achieved. Eventually Mululu died, so the daughters set off to find Conduk, who lived to the north. Many days later, they found the medicine man who directed the four to climb a rope that lead up into the sky. Naturally, they were frightened — who wouldn’t be!, but with the encouragement of Conduk, they climb to the top of the rope where they found their father waiting for them. Of course, all four were delighted to be reunited with their father and these stars shine brightly with their happiness. Today we can still see them is their celestial home, marked by the four stars of the Cross, and their father being represented as Hadar or Beta Centauri. Others in Australia and South America have seen the stars as a mark of the footprint of either the Australian flightless bird, the Emu (Dromaius Novaehollandiae) or the Andes smaller bird, the Rhea or Ñandû (American Rhea). Another footprint legend of birds is that the Crux is the talon marks in the sky among the birds of prey like hawks and eagles. One Aboriginal tribe of Arnham land, the Yirrkula, says the stars mark as the one of the feet of the wedge-tail Eagle. The Mapuches, a mid-South American people of several regions sharing the same language, occupied the middle latitudes across Peru and Argentina. These people once had a rich culture and mythology with retained stories about the stars of the in bird, insect and animal constellations. 0n the Peruvian plateau, the peoples of the Aymeara still celebrate the day of Chakana, which is a celebration of the harvest. It is held on 3rd May each year mainly because the early Peruvians had seen Crux being at it highest position in the sky at this time. We have said enough about the Southern Cross and its history, but let us now examine the most the prominent celestial treats it contains. I have selected those visible in small telescope or binoculars. More detailed text may be found of many of these objects elsewhere from this site. If you are familiar with these objects, then think back to your first views of these delights — likely your first deep-sky celestial objects amateurs observed through any optical telescope. For me the first objects were Alpha Centauri, Alpha Crucis and the Jewel Box. These sights I can never forget. as stars appear seen in the Galaxy, that Milky Way. It is because of this, that many interesting objects will appear, as we are looking into the richness of the rest of the Galaxy. Crux happens to lie in one of the brighter regions of the Milky Way. One of the most obvious feature of the Cross is the dark nebula under Hadar / Beta Centauri and across and underneath Acrux. Unfortunately this object is mainly obscured in city night-time skies because of light pollution, but in country skies, the region is very obvious. The inky-black darken patch looks more like some deep hole in the firmament but it is a giant cloud of gas obscuring the more distant light of the Milky Way. Closer inspection finds that the Coal Sack edges are rather ill-defined, and by staring at its structure reveals many other structures and bays not often presented in astronomical images. Figure 3. clearly shows the outline of the Coal Sack. (marked as a gold line) This the general view of is shape. On the darkest night the main body ofthis dark cloud slowly diminishes to the south-west, and below Acrux becomes just a small stream of blackness. (Figure 3, shows this as a yellow line) This extends further westwards, looping up towards the bright emission nebula IC 2948 (red) and finishing near the famed Eta Carinae Nebulae NGC 3372 (not shown). Other wisps of dark nebulosity surround the area, and with the naked eye most of major part are shown in the figure. (Brown line) Most prominent is the so-called Dark Doodad Nebula, which is a dark nebula passing through Musca to the South of the Cross. If you eyes are acute enough, you can possibly notice the faint 6.5 magnitude star within the nebulosity. (White dot in Figure 2, above the word “Coal”.) Even with binoculars, the internal area in sparsely populated with only a few stars. We can easily assume the Milky Way must be considerable more distant from us than the Coal Sack itself. However, the Coal Sack is currently estimated by astronomers to be 190 parsecs or 620 light-years from the Sun. Gas densities are very low, so much so, that even the best vacuums that can be artificially made on Earth are some five thousand times too dense! The name Coal Sack probably derives from drovers or miners in the Australian outback. These men presumably were sitting around the campfire, and saw this region as “black as coal” compared to the surrounding bright Milky Way. Sir John Herschel also states an alternative for the origin of the name, saying it was also used in the early 1800s by sailors when visiting the southern seas. According to Richard Allen, the Coal Sack is also appropriately known as the Black Magellanic Cloud. Acrux or Alpha Crucis is a brilliant blue-white star being easily found at the lowest base or point of the Cross. It is also closest of Crux’s main stars to the South Celestial Pole. Examination using binoculars reveals the fainter 4.9 magnitude companion star — some 89″ away, and this has changed little since Father Fontenay from the Cape of Good Hope discovered the pair in 1685. Telescopes greater than about 7.5 cm revealthe brighter component is again double. Often labelled as α1 Cru / Alpha(1) Crucis, the visual magnitudes of these two stars are1.6v and 2.1v with both being separated by 1.4″. All three stars are coloured blue-white. An additional 12.5 magnitude field star lies roughly midway and slightly east of the wide pair, making an obvious right-angle triangle. Acrux’s field is sprinkled with many stars. This is still one of the most impressive telescopic sights in the whole sky. The view of it still thrills me every time — even though I must have viewed it several hundred times. Some 1° south-west of Beta Crucis / Mimosa is one of the most magnificent and beautiful of the open star clusters that was first discovered by James Dunlop (Δ301). Known as the Jewel Box or NGC 4755, this small ‘A’ shaped asterism is quite different than most open cluster because of its tiny size and numerous bright stars. Its has the given name of the Jewel Box which was given by Sir John Herschel in the 1830s, after the large number of different coloured stars found within its small 6′ arcmin size. When viewed with a small telescope up to fifty to one hundred stars can be seen in a velvet field. My first look at the cluster was at Sydney Observatory through the 11¾-inch refractor. I was immediately stunned with its gorgeous richness and beauty, mainly as the city lights made the coloured backdrop appear as rich royal blue. A faint twinkling of the occasional star gives the cluster an almost divine nature. Brightest star is the true Kappa Crucis which is a bright orange-red supergiant, whilst the other stars are coloured mainly blue, white and yellow. How many colour can you see? Distance is estimated at 2.4 kiloparsecs or 7,700 light-years from the Sun, with its age about ten million years — considerably younger than many other open clusters. A brilliant orange-red star at 1.6v visual magnitude. When viewed with binoculars or small telescopes, the bluish companion is easily seen. Although they are not physically connected, the stars have wonderful colour contrast, especially with smaller instruments. Distance is estimated to be 220 light-years. Two equally bright stars are easily separated even in smallish telescopes. Both stars are bluish in colour in a rich starry field. This pair proved a good test for my 7×50 binoculars can just separate the duo, but when tested during poor seeing, this became much more difficult. You can try viewing Mu Crucis during moonlight, and find the sky glowing velvet, enhancing the this pair. In reality this dual blue giant system estimated to lie 650 light-years away. This cluster is found north of Acrux by almost 1°, you will need a telescope greater than 10.5cm. The field contains a collection of stars between magnitude 11th to 15th, and it size covers about four or five times the area of the Jewel Box. I saw that the stars were yellowish in colour. A yellowish star can be found 1.5° north of the star Lambda Crucis, which is a Cepheid variable. Over several days, the star changes in a period of 4.68 days between magnitude 6.1 to 6.8 and spectral class G7 to F6. Twenty-five stars between 11th and 14th magnitude lies just across from Epsilon (ε) Crucis. It is a visible in apertures greater than 75cm., and its size is about the same as the Jewel Box cluster. T Cru is an orange-red star visible in a starry field 0.5oNE of Acrux This is another Cepheid variable that varies as much as S Crucis. The period is 6.753 days, varying between 6.2 and 6.8, and changing spectrally between G1 and G5. This double star is found just south of Beta Crucis, and is a wide pair that appears as a orangery and yellow stars with about three magnitude in difference. The given magnitudes are 4.68 and 7.8, whose separation is a wide 26.7″. This is an interesting for small apertures, especially while in the region of β Crucis. AO Crucis is a variable that can be found about halfway between α Crucis and β Crucis, and about 1.1°SW of Alpha (α) Crucis itself. The reddish colour is quite prominent, though this is a LC-type variable, with the irregular variations change between 7.5 and about 10.0. This deep-red star lies next to Beta Crucis and is so easy to find. Its key feature is that this star colour is the deepest of crimson, and is similar to the colours seen in X TrA or R Centauri. Approximately 9.5 mag, EsB 365 is 45 arcsec. from Beta Crucis. A 10.5 cm is really required to see it clearly, though some claim seeing EsB 365 in 7.5cm is quite possible. Searching for it is worthwhile, as it is quite an enchanting object. Two hours eastward in Right Ascension are the two stars of Alpha and Beta Centauri. Together, both point somewhat north of the Cross, though the name of the ‘Southern Pointers’ still remains. Alpha Centauri is the brighter of the two, and appears distinctly yellow in colour, and is the third bright of all the stars. Aviation navigators have only just named it Rigel Kentaurus or Rigel Kent. Amazingly this recent designation did notoccur until the beginning of the 20th Century. When viewed through some small telescope, the apparent single star separates into two stars of almost the same brightness, given as 0.3v and 1.7v magnitude. In 2002, finds the separation about 19 arc seconds, which is at the moment continuing to slowly diminishing. Words can never adequately describe its general beauty. One of the first discoveries about this pair was the fairly rapid binary motion, orbiting under its mutual gravitation once every 79.8 years. Not only does it quickly change its position, but it has been found to slightly ‘jump’ against the background stars over the year. This movement is the parallax, that indicates proximity to the Sun. Astronomers in the beginning of the last century knew it was the closest of all the naked-eye stars, whose value is now quoted as 4.3 light-years - or about nine thousand billion kilometres away. If this is theclosest of stars, then how much farther are the rest of the stars in our own Milky Way Galaxy? R Cen has an uncertain distance. Some references still quote values as low as 123pc. (400ly. ), but the latest Hipparcos satellite data places it at 161±13pc. or 525±43ly. This smallish blue planetary nebula is foundon the western of the Cross. Known as the”Blue Planetary “ or”The Southerner“, a telescope is needed to see it as its visual diameter is 13″, though the ”star“ is even visible in binoculars. The best way to be certain of it location is to inspect each star, the nebula is the one that will not focus, while the stars will appear as tiny pinpoints. NGC 3918 is one of the brightest of the planetaries in the southern skies and is a bright 8.5 magnitude. The beauty of the Southern Cross, and the variety of the objects it holds, make it a worthy constellation to start with for the novice amateur astronomer. On a cold and crisp wintery night, gazing at its beauty and charm, soon makes you forget the cold hands and feet. As an observer, if you have not observe some of these objects, then I recommend you do. I am certain you won’t be disappointed! Clear Skies To You ! 3 Gamma Crucis γ Cru / Δ124 DS 12 31.2 -57 07 1.6/6.7 PA 11° 131″. 4 Mu Crucis μ Cru / Δ126 DS 12 54.7 -57 11 4.3/5.6 35.0″. 11 Alpha Centauri α Cen BS 14 39.6 -60 50 -0.04 / 1.17 Binary star 4″-20″ Per.=79.9 yr.
16 The Blue Planetary NGC 3918 PN 11 50.3 -57 11 Mag.=8.5 Type 2b d =1640 pc. 19 Eta Carinae Nebula η Car : NGC 3372 Neb./OSC 10 44.3 -59 53 Var: 2.1p Dia= 80′ d=1.1 kpc. 23 Musca Globular 1 NGC 4833 GSC 12 59.6 -70 53 Mag.=7.8 Dia.=13½′ Type VIII F3 d=6.6 kpc. 24 Musca Globular 2 NGC 4372 GSC 12 25.8 -72 40 Mag.=7.2 Dia.=18.6′ Type XII F5 d=5.8 kpc.